Hanger Bolts, also known as hanger screws. The bolts with double thread end, one side with wood screw thread, the other side is machine screws thread. 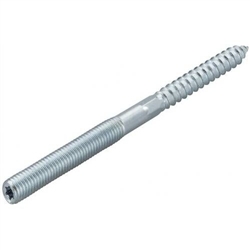 Hanger bolt Standard: DIN 88149 , Custom design welcome ! One end of Hanger bolts can be with torx as request.